Cathy Tomm Quilts: Purple On the Go! All the purple I got sewn this month. I love to see it all up at once. 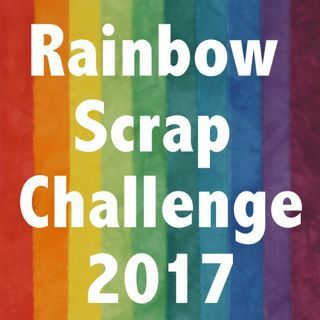 I have linked up with Soscrappy and the Rainbow Scrap Challenge 2018. I got 9 Poverty Piecing blocks done today. Yes, Crumb blocks, I like to call them Poverty Piecing in memory of a friend Lou. She showed them to me many years ago and she called them Poverty Piecing. I do not have many little bits in the scrap box now, mostly strips and some squares and large pieces. Migrating Geese blocks. I do not know if it is a real pattern but I have seen some of these blocks on the internet and thought I would make some. My blocks use up 2" squares and then the geese have a 2" by 3 1/2" rectangle. I think that means the blocks finishes to 9 1/2" sq. I had 2 of these strip sets and needed one more. I have an idea how I will use them but until I have more done there is not much to show for now. I have 3 done in pink from a few years back. Maybe in a month or 2 I can show you more about what the plan is. This is my all time favorite rainbow fabric to use for binding. I had some like 6 years ago but then could not find more. Well last week at a 20% off sale, there it was. I got 2 m more of it. 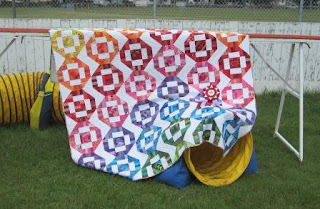 I hope to use it as I get some Rainbow Scrap Challenge quilts done. I am so happy! You other scrap challenge ladies should understand. I used the rainbow fabric on this quilt. I had this quilt done in early 2012 and it got a prize at the Canadian National Juried Show in May of 2012. I think I will start some string blocks and get some purple strips used up. I got out the old phone pages. I have kept some books. Now what size to make my blocks. I am going to go look around for string blocks. Fun to see all your purple blocks together - they will all make great quilts - eventually! Your purples are awesome!!! I'm making crumb blocks too, it's a great way to feel like you've really used everything! I very much enjoy the 'geese' blocks. And the hexagons are going to be fabulous with their other colors! Hey, I love that we both do end-of-the-month collages! Your blocks are wonderful. We have several of the same blocks; Squared Away, Geese Migration - or a variation thereof - and crumb blocks. And we’re both Cathys to boot. I’m with you on loving that rainbow fabric for binding. I love a good stripe, but the rainbows make it extra special!! Love that wall of purple, your prize winning quilt is exquisite and what a great find on the rainbow binding fabric. What a wonderful range of PURPLE scraps in all of your RSC blocks for February!! !